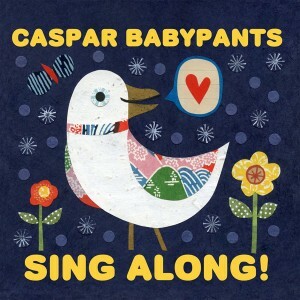 Caspar Babypants – Sing Along! 1. Bad Blue Jay (traditional / Chris Ballew) – There are plenty of traditional songs on “Sing Along!” album. It’s hard to say, which song is Chris Ballew…I mean Caspar Babypants original, and which one is traditional. Many of the traditional songs has been rewritten or altered by Mr Ballew to make them fresh again. Bad Blue Jay is a fine example of this. Catchy song with nice chorus. 3. Crawl (Keith Mackler / Chris Ballew) – Great little story about learning to crawl. This song is over before it even started. 4. I Wanna Be A Snowman (Traditional / Chris Ballew) – It’s middle of the summer, but this song makes me miss winter already. “I Wanna Be A Snow Man” is full of awesomeness . Stone Gossard (from Pearl Jam) playing bongos, and they do add plenty to this song, among with fine bluesy guitar solo, and harmonica parts. Great and catchy lyrics. One of the best tracks. 5. Funny Bone (Chris Ballew) – Chris does his best Weird Al impressions on this one.. I even had to check if that is Weird Al singing some of the vocals. Weird Al does make a guest appearance on this album, but not on this song. 7. Ba Ba Black Sheep (Traditional / Chris Ballew) – Another old traditional song transformed Caspar Babypants way. 9. Shadow (Chris Ballew) – First song where the tempo slows down a bit. I would have preferred this as an instrumental track. It builds up nicely towards the end. 11. Mister Winter Bee (Kate Endle – Chris Ballew) – I’m not fan of these “rapping” songs. I have never heard a good children song with “rapping”. Not as a kid, nor adult… reminds me about “Look At All These Elephants” from previous album “This Is Fun!”. Love it or hate it..
12. Long Long Dream (Traditional / Chris Ballew) – Nice dreamy vocals in the beginning. Middle of the song features accordion solo by Weird Al. 13. Ring Around The Rosie (Traditional / Chris Ballew) – Old nursery rhyme with partially new lyrics. Not my fav. 14. Them Bones (Traditional / Chris Ballew) – Hypnotic beat, funky wah guitar parts. Outtasite shines with his lazy gravely vocal parts on this one. It’s the contrast between vocals that make Chris Ballew & Outtasite duo such a great…eh…duo! I need more! One of the best tracks. 15. Pussycat Pussycat (traditional / Chris Ballew) – Another old old nursery rhyme mixed with new lyrics. 16. Me and My Echo (Chris Ballew)– This was played acoustically on a recent Ron and Don show , and I must say that I prefer the acoustic version more. Studio version is bit too slow, and it runs bit long too…It’s the only track that has a fade out on this album. Me and My Echo is clearly one of the songs that is going to shine more when played live. 17. Butterfly Driving a Truck (Tad Hutchison / Mia H / Chris Ballew) – Title would suggest that this is a new version of Dune Buggy, but this is Beach Boys meets Caspar Babypants, nice acoustic guitars and catchy lyrics. 18. Helicopter (Traditional – Chris Ballew) – More background details wanted…This one is killing me…I don’t know why this sounds so familiar. I know it’s a traditional song, but it doesn’t help my head. 🙂 Minimalist Hawaiian type of song that has plenty of headphone candy… Damn catchy. Oh the guitar part…I wish that there would be more of that. 19. Sun Go (Chris Ballew) – Starts of just like the “Monkey River”. Simple acoustic tune with nice vocals by Frances England. 20. Baby Cloud (Traditional – Chris Ballew) – Haunting song with beautiful vocals by Rachel Loshak. Nice ending to this whole album. Following weeks will tell if this is the best Caspar Babypants album yet. If you like the previous Caspar Babypants albums, you’re gonna love this one too! Tags:Caspar Babypants, Chris Ballew, Music, Review, Sing Along!